Minor Miracles for a New Place was a performative intervention by DodoLab about incongruent realities existing in the same space. It was designed around a wooden heirloom angel—gifted through family from Mexico to Canada—that may (or may not) have been capable of performing some minor miracles. 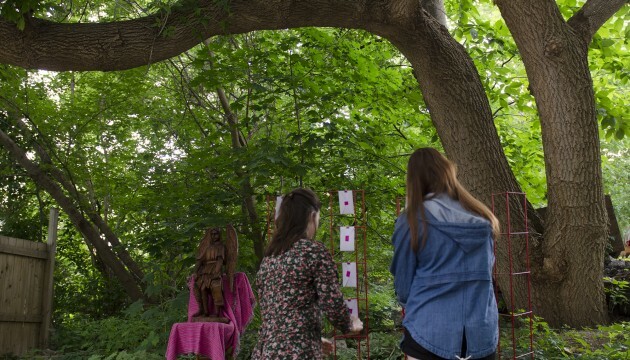 For one day, DodoLab offered this angel and its powers, whatever those might be, to the community, an opportunity to ask for miracles that also acted as a survey of what is almost possible here in Guelph. The project inhabited the strange, even humorous, disjunction of this object’s presence in Canada, where it was at odds with the tendency to pinpoint exact causes, and predict and control future outcomes. By collectively enacting the possibility of the miraculous we welcomed this object into its new context and created a moment of acknowledgement that we forever live with forces that are beyond our control. People of Good Will is a collaborative project among the Guelph Black Heritage Society, Musagetes, Local Artists’ and the interdisciplinary artist collective, Postcommodity that seek to re-imagine the Underground Railroad narrative as a living history and metaphor of cultural self-determination for immigrants and culturally diverse peoples living in Guelph. Over the course of one year, the project will produce arts, music, Performance and cultural programming that brings the spirit of the Underground Railroad into the present consciousness of the people of Ontario. DodoLab is an experimental, ever-evolving and often collaborative creative practice, directed by Lisa Hirmer, that is focused on developing provocative approaches to working with the public and the nebulous reality of public opinion. Often modeled as a type of performative research, the work explores and responds to the public’s relationship with contemporary issues—meaning that it is never solely an idea in and of itself that is explored, but rather an idea in relation to the public’s (or more accurately a specific public, counter-public or community’s) understandings and beliefs about that idea.